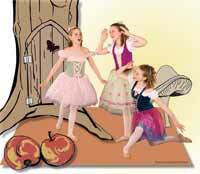 If fairies are indeed real, then Hilarie Neely surely is their woodland choreographer. "Fairyopolis" will make you believe when Footlight Dance Centre's performers take the stage at the Wood River High School's new Performing Arts Theater Friday night. The story follows three young friends, Kaia Jensen, Taylor Telford and Laine Whittier, who discover magical fairy realism while playing together. After a series of dance numbers that cover the spectrum from ballet to modern, jazz to hip hop and tap dance, showcasing the hard work of Footlight's dance instructors and dancers through the winter, the performance will culminate with a ballet summed up as a romantic reverie, "Les Sylphides." after extensive renovations. Other company artists Emmie Altermatt, Annie Ashfield, Shelby Barnes, Liza Buell, Wyatt Caccai, Chloe Davis, Laurel Gaeddert, Alberta Jefferson, Emily Seiller, and Moyo Tian will help ensure it is a memorable time. Neely, fresh off the theater's opening gala that included a sampling of arts programming in the schools with a choral, theatrical, band and orchestral performance, said looking forward, "Each person who enters the theater is now in for a memorable experience." The turnout was tremendous, reinforcing that it was money well spent. "It was exciting to see so many different parts of our community coming together," she said. "This is what theaters are, a place we gather to celebrate humanity through the arts, to obtain information about our community, government, education and life experiences." required all measure of expertise in various fields to learn how to manage the high-tech improvements in lighting and sound. "Another important piece to this puzzle was the process—It was so impressive, the amount of expertise that went into the planning and building." She offered special thanks to Company of Fools John Glenn, Sun Valley Summer Symphony School of Music's Kim Gasenica, sound technicians Ted Macklin and Jay Cutler, Sun Valley Center for the Arts' Kristin Poole, Caritas Chorale's Candace Witt, Sharp Edge Lighting Design's Lisa and Michael Kimmel, planner John Gaeddert and Blaine County School District staff Mike Chatterton, Howie Royal, Max Stimac, Karl Nordstrom and Rebecca Martin and BCSD Board of Trustees members Paul Bates and Kathryn Graves. Neely said arts students are clamoring to get their feet on the theater stage and their hands into running the theater, excited for the possibilities. "Watching the students on the stage was memorable," she said. "This new environment helps them to rise to another level of confidence, expertise and ability as they share their talents." "Fairyopolis" starts at 7 p.m. Friday, May 11, continues Saturday, May 12 at 7 p.m. and concludes with a performance at 2 p.m. Sunday, May 13. What: Footlight Dance Centre production. When: Friday and Saturday, May 11 and 12, at 7 p.m. and Sunday, May 13, at 2 p.m.
Where: Wood River High School Performing Arts Theater, Community Campus, Hailey. Tickets: Available at Iconoclast Books in Ketchum, Yellow Brick Road in Hailey and at the door.